The Tottenham Stadium Leather Wallet has a wide full colour panoramic view of Tottenham stadium when you open the wallet, it makes a perfect present for any dedicated Tottenham football fan and a fantastic way to show their allegiance to their team. 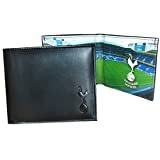 The wallet has department for ID, cards, notes and is made from geniune leather with the team’s crest embossed on the front and comes supplied in a elegant black gift presentation box bearing the Tottenham FC club crest. This is an official Tottenham Football Club Merchandise.